Your free download should start automatically - if it hasn't, please click here to download the casino. Run the installer (PC only). Make a casino deposit and start playing, SA style! 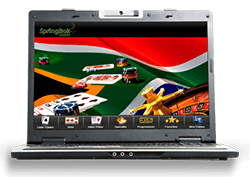 Springbok Casino aims to meet all preferences of its members in more ways than one. Our diverse gaming catalogue will give you access to classic and video slots, generous progressives, multiple variants of all popular table games, numerous video pokers, and specialties such as Keno, Bingo and Scratch Cards. We know some of your prefer playing online via internet browsers, while others opt for downloading casino software, which is why we've made both options available. However, let us give you 3 good reasons why downloading is the way to go. First of all, our downloadable software will allow you to enjoy RTG's gaming portfolio to the full. Traditionalist will gain access to all of their popular fruities, fans of feature-rich video slots get to play a full range of engaging multi-liners with multiple bonus rounds, and players looking to score mega wins in a single spin, get to choose among an array of progressive jackpots, table games included. Secondly, by downloading Springbok software you'll be able to enter our tournament section and take part in high-adrenalin action provided by an opportunity to compete against your fellow gamers. Daily, weekly and monthly slot tournaments come with hefty prizes, and our regular Freerolls offer an opportunity to play and win without having to invest a single Rand. Thirdly, our software is 100% safe and takes only minutes to download and install. You don't have to worry about opening gates to any kind of malware; we've implemented all available security measures to make sure the only thing added to your hard disk is a wealth of some of the best casino games around.